We are family members of the local canoe and kayak club. It is a fabulous club that is SUCH incredible value for money and puts on some fab courses/events and challenges throughout the year. 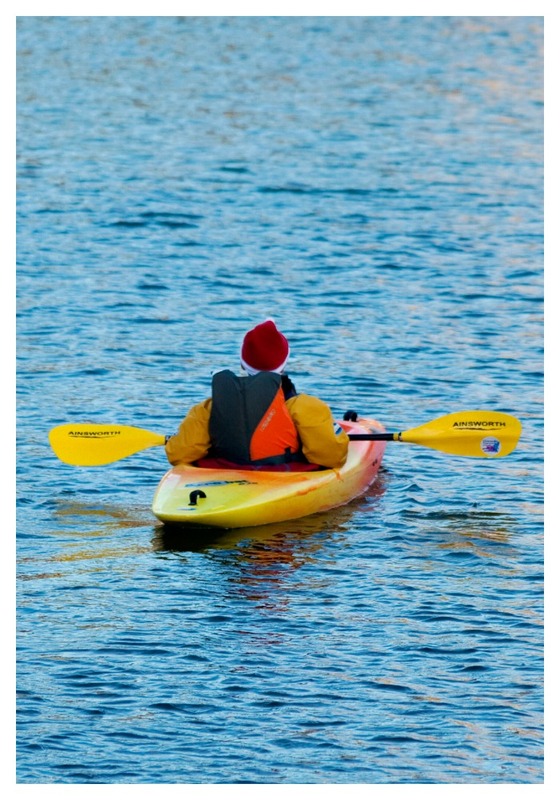 The kids, in the winter, are often in the pool with the club and their kayaks practicing all sorts of techniques and drills. They really do love it and for what they charge ( a minimal once a year fee) for the whole family. It is probably the best value thing we do. 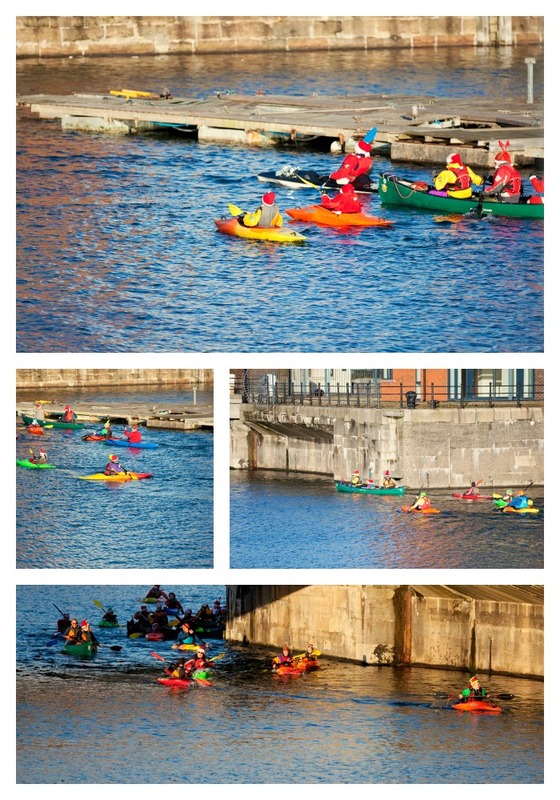 On the sunday before christmas (which happened to be our wedding anniversary) the club held their santa paddle in the docks. 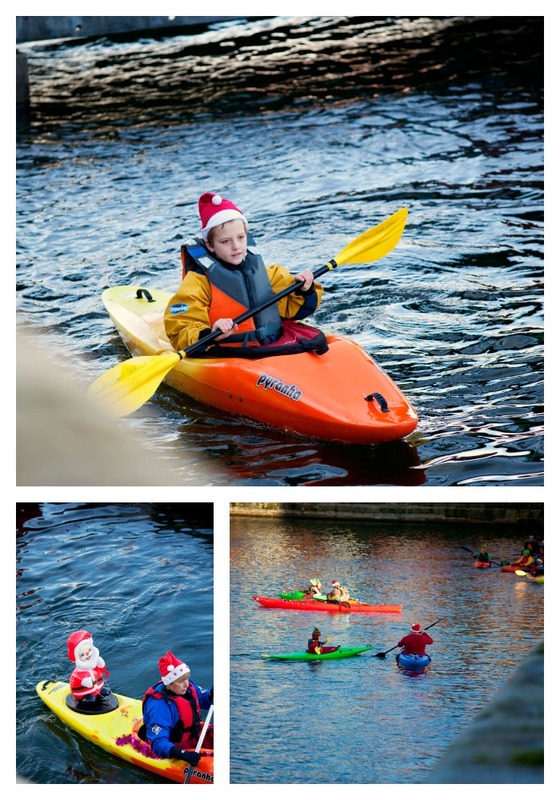 The idea for a fun and social paddle up and through the docks for mince pies and hot mulled wine and then return to the marina bar for some hot chocolate and cake. 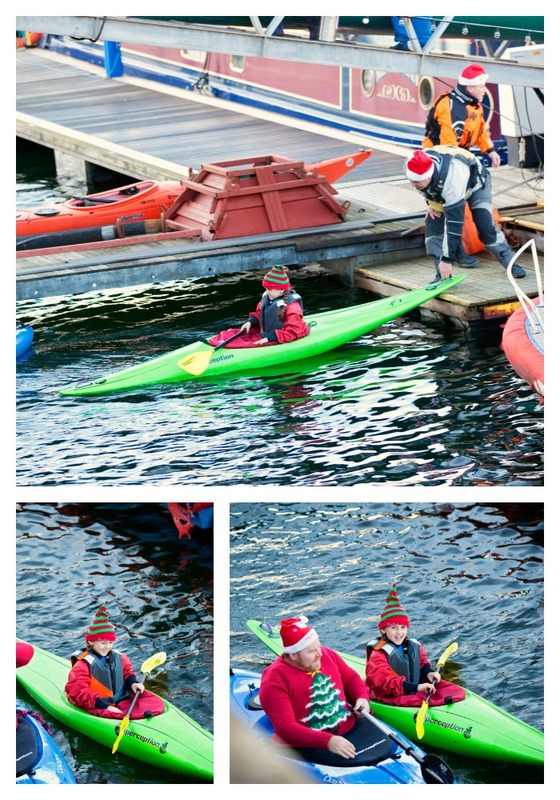 The kids were keen to have a go and we ventured off with our santa hats. The problem was a little that my OH, who is normally super prepared, had under-estimated the weather, which whilst was glorious sunshine was really really cold! 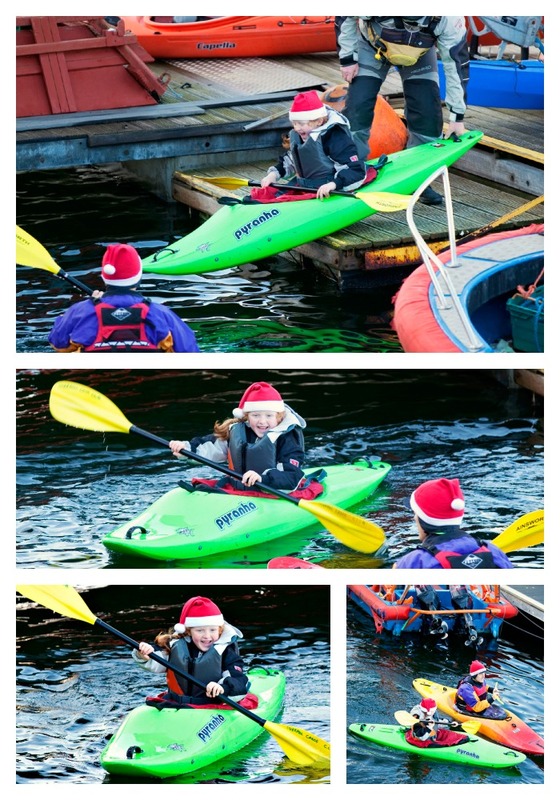 So they were a little unprepared for an hour and a bits kayaking in cold water! As i watched them go off i did wonder how long they were going to cope with being so cold! But they did pretty well, apart from my eldest girl who ended up taking a swim! eek! and so got a ride in a long boat wrapped in the coats of some generous other rowers. They all really enjoyed it. it was fun to get down there myself and see them row. Often the events are in the evenings and so the OH, who is the keen rower, takes them and i stay at home with the younger ones. It was lovely to see it for myself. 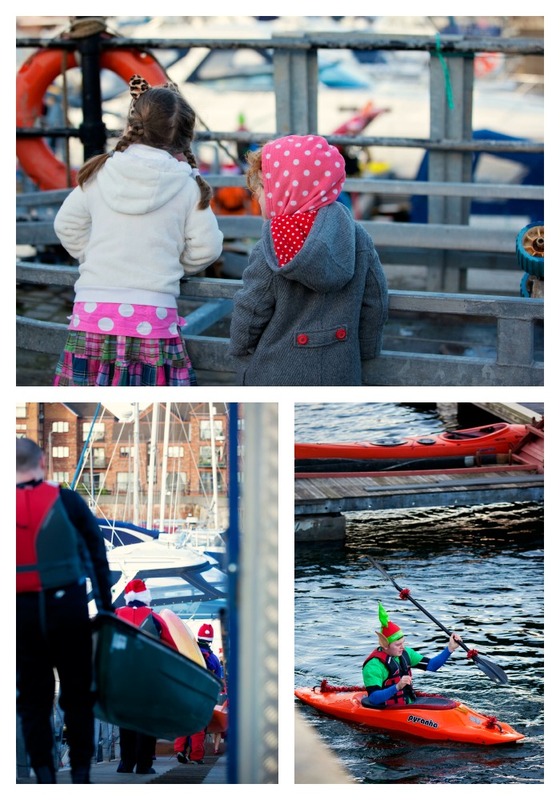 The little girls and i wondered along the seafront, bracing ourselves against the cold before we retreated to the boat house for some lovely hot chocolate and warm up. We spied them returning under the bridge and ran out to shout and wave at them. 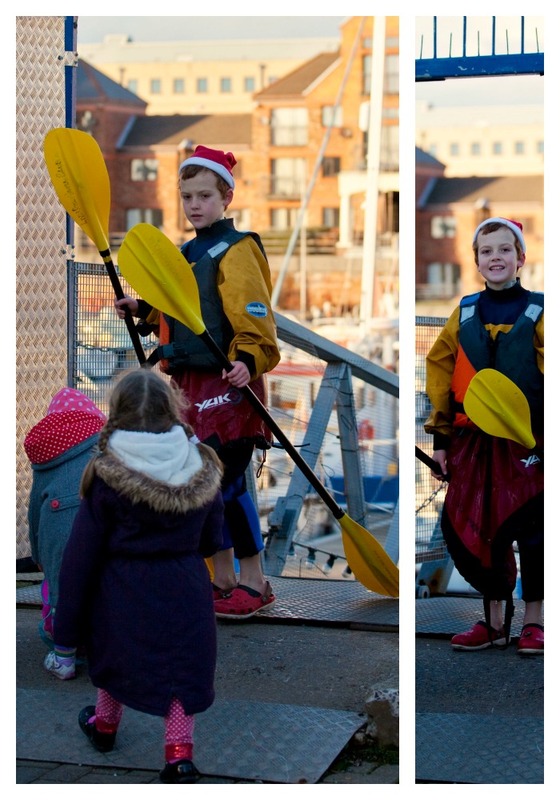 My boy had managed the row completely , something he was really chuffed about but both the girls had ended up hitching a ride, our youngest daughter managed to row half the distance to the mince pie stop but i think after that the thought of rowing all the way back was too much for her. I have to say i was really proud of how well they did. Im not even sure i could manage it!! We had just enough time to see the last of the sun setting on the boats in the marina and then we headed home to really get ready for the big day!! What a wonderful thing to do and such vibrant photos too, it may have been cold but you wouldn’t know from the photos. A perfect lead up to Christmas and a great way to ensure they are all tired for an important night’s sleep! Thanks for linking up. Sara (@mumturnedmom) recently posted…#CountryKids – fun with sledges! What a great club and sport for the kids to be part of! Looks like they had an amazing time despite the cold weather. 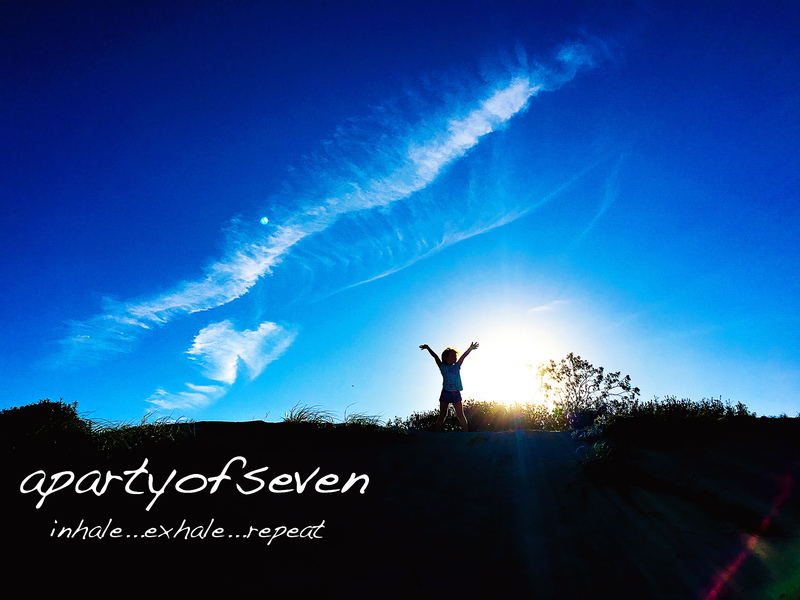 And wonderful photos from you! The Reading Residence recently posted…Let’s Go Fly A Kite! Iona@redpeffer recently posted…Can you caption these two cheeky little faces? Well apart from the quick dip (which sounds painfully cold!) 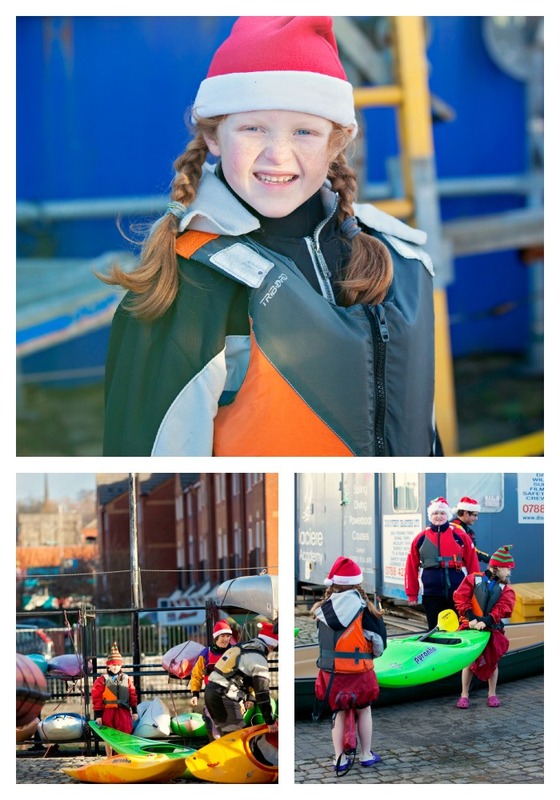 it looks like an amazing way to kick off Christmas, and even the swim will make a great story in years to come! I really would like to take my family – a few have been separately but not together. Loving how your children have matching red hats and shoes. wow looks a great challenge well done to all of them! What a great activity. Well done for them to brave the cold elements! 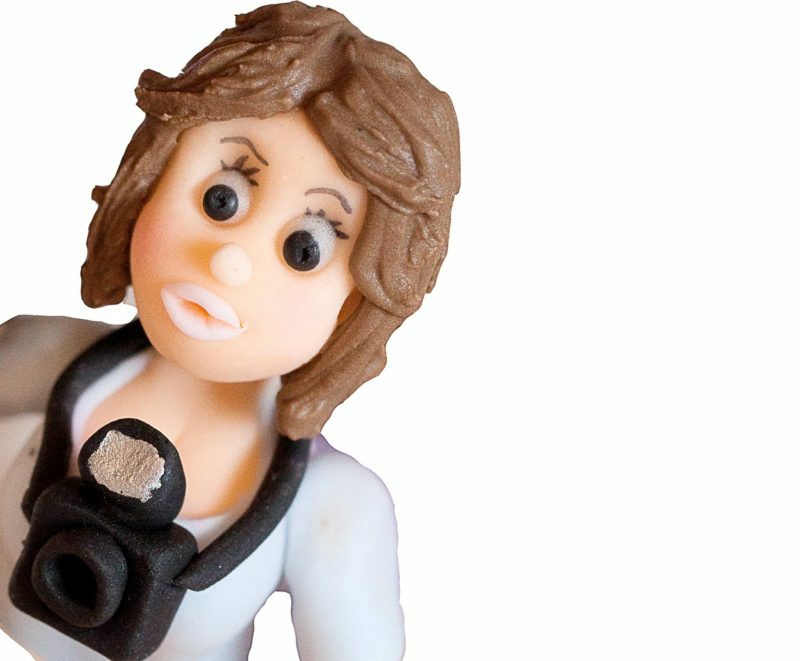 Great shots – that looks such fun! What a brilliant adventure. Its great that the children doing such an exciting outdoor activity. 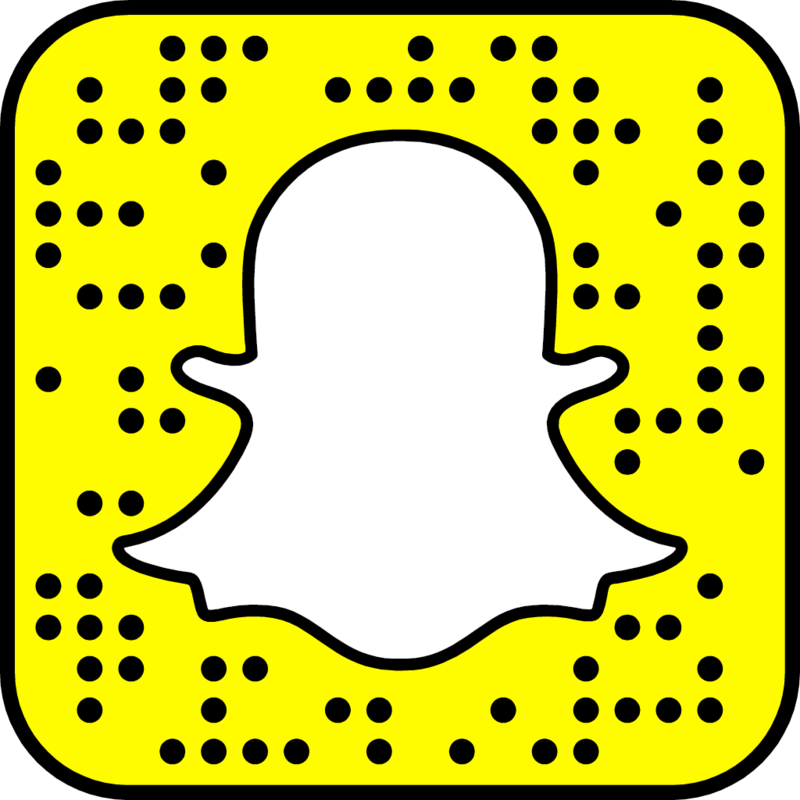 Your photos look amazing to. Lots of smiles and fun. 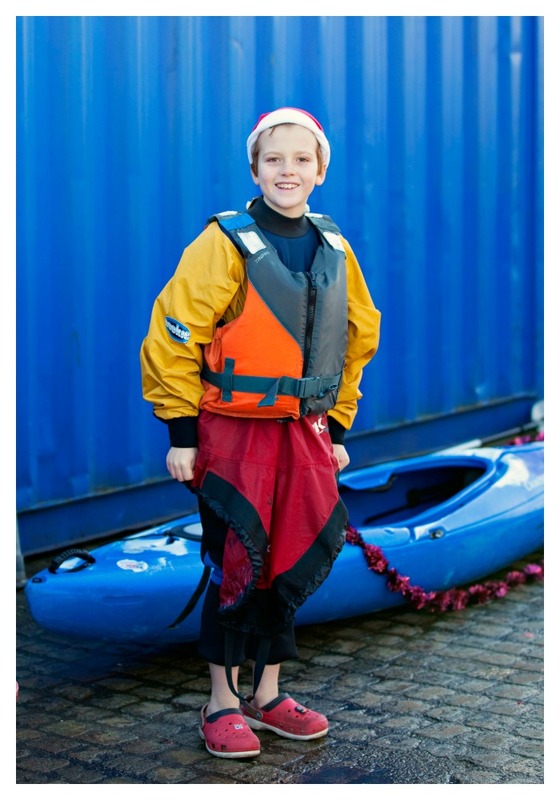 Bit late to this one, but love the idea of doing kayaking of a family. Being next to the water makes me very happy so doing this on a regular basis when they’re a little older would be great.